Chocolate house fudgie rabbits. No Easter basket is complete without a fudgie rabbit. 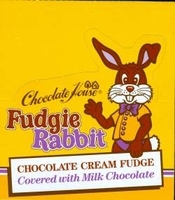 A rabbit shaped candy with a creamy fudge filling smothered with milk chocolate. Once you start eating these little guys you want to keep eating more. These are a perfect Easter basket candy for those chocolate lovers. Who do you know that doesn't like chocolate ? Stock up today before these rabbits hop away. Each box has 24 individually wrapped fudgie rabbits per box.